Thanksgiving without cranberry sauce isn’t really Thanksgiving in my book. 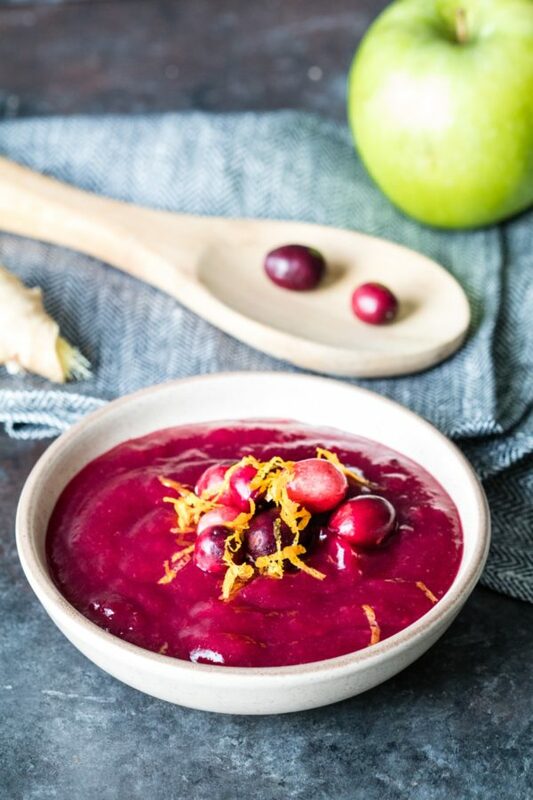 Impress your guests with this cranberry-ginger sauce! There also is some white wine in this recipe. It reminds me of the Julia Child quote, “I enjoy cooking with wine…sometimes I even put it in the food…” haha. Such a classic! The past 2 Thanksgivings I have done a majority of the cooking for the family. I figured it’s time to learn how to do it since one day I WILL have to do it all one day. My #1 tip for those cooking a big Thanksgiving feast this year: Wear comfortable shoes in the kitchen!! You’re on your feet all day (or maybe even 1-3 days). My 2nd tip would be to prep as much of the meal ahead of time as you can. Get the stuffing ready, your pies and as many side dishes as you can ahead of time. Then I always like to use sticky notes to remind myself how long each dish takes to bake in the oven and for how long. This helps with making sure you get everything on the table at the same time and while it’s all still nice & hot! I think that is the most stressful part about big holiday meals – getting everything on the table at the same time and making sure it’s hot, amiright?! 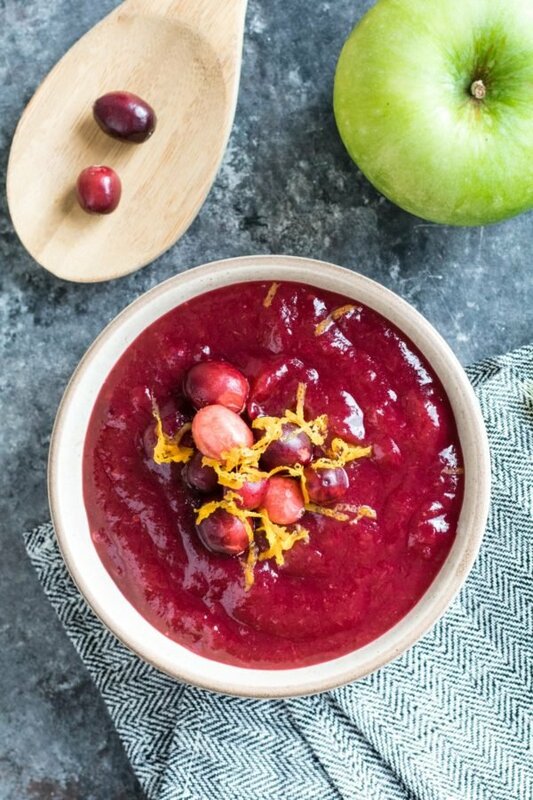 My last tip would be for you to make this cranberry ginger sauce! What are you doing for Thanksgiving this year? I’d love to hear in the comments below! And lastly…we have SO much to be thankful for every day of the year – not just on this particular holiday. Remember that! <3 Love you all! 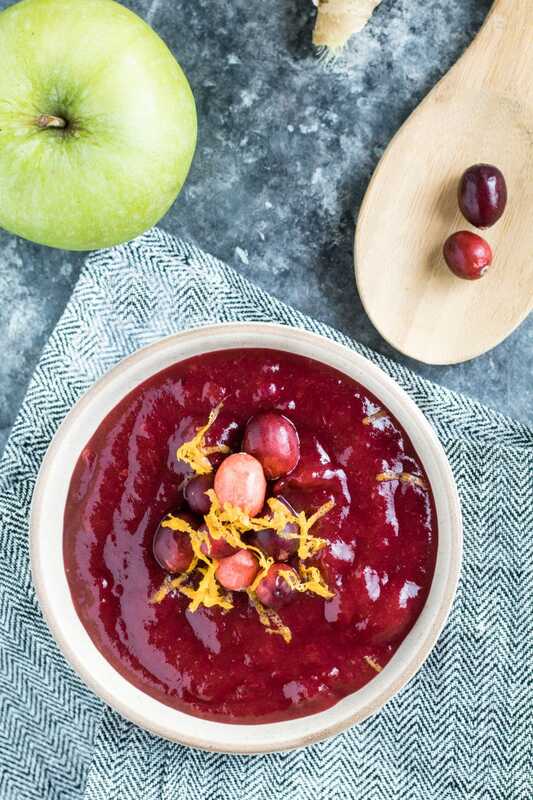 This Cranberry Sauce is filled with fresh orange juice, fresh ginger, Granny Smith apples and a touch of cinnamon. Your guests will love this sauce! Combine the first 4 ingredients in a large sauce pan, bring to boil - about 3 minutes or until sugar dissolves, stir frequently. Add in apple, ginger, pepper flakes and cranberries - stir and bring this to a boil. Reduce the heat and simmer for 35 minutes, or until thick. Remove from heat and stir in the orange zest. Cool and then stir in pistachios (optional). Makes ~4 cups. YUM!! Looking for more cranberry inspiration? 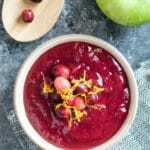 Check out my Easy Homemade Cranberry Applesauce recipe! PIN this CRANBERRY SAUCE recipe for later! Love that ginger and the white wine!! Beautiful flavors! Agree, cranberry sauce is always good, even after Thanksgiving. Love the ingredients you used in this one! This sauce was so easy to make and it tasted way better than any store bought cranberry sauce! So glad you found it simple and delicious Meme! 🙂 Thank you! I made this last Thanksgiving and am coming back to it again this year, the BEST I’ve ever made! I’m so glad your family loved it! Thank you soo much! I love the hefty addition of the ginger to this classic. Cranberry sauce should be a year-round recipe! It really should be! Thank you so much Liz! Adding ginger is such a great idea!! Thank you – gives it such a great flavor! The ginger is hands down where it’s at on this one!! !